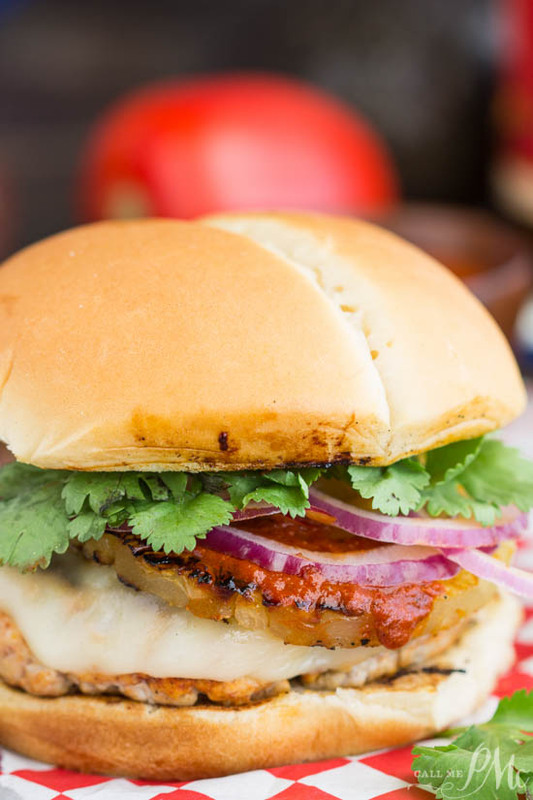 My Tacos Pastor Pork Burger has the same flavors and spices as this the popular Mexican street food Tacos el Pastor. 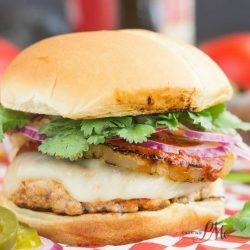 A combination of chiles, pork, pineapple, cilantro, and onion combine wonderfully in a burger recipe. I enjoy Tex Mex food. 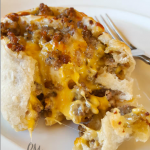 As well, I’ve shared many recipes for Tex Mex inspired food including Skillet Mexican Street Corn, Skinny Margaritas, Spicy Chorizo Queso, and Tex Mex Pimento Cheese Dip. However, as long as I have liked Mexican foods and flavors, I had never had Tacos el Pastor until a couple of months ago. Where have I been? I’m completely obsessed with them now. Not only that, after I took the family to a local restaurant that serves the best Tacos el Pastor, they have been a favorite of my whole family. Tacos el Pastor are spicy without being overly hot. 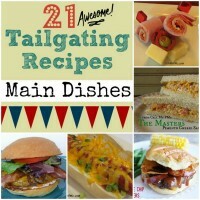 They are full of flavor and texture with all the pineapple, chiles, cilantro, and onions. 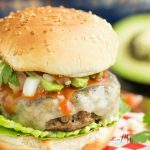 It was a natural thought process when I started planning for Burger Month that I adapt Tacos el Pastor into the all-American favorite burger. 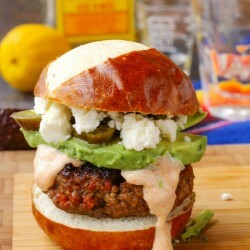 That’s how I came up with this Tacos Pastor Pork Burger. I kept the same flavors, the slightly sweet pineapple, the earthy cilantro, the crisp pungent onion. 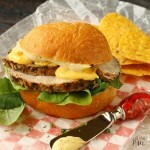 And I added a mild creamy cheese because burgers simply need cheese. My pork to fat ratio that I used for my Tacos Pastor Pork Burger was 85/15. If you don’t want to go through the process of soaking the dried chiles, simply heat vegetable oil in a large skillet to medium temperature. Add 3 to 4 tablespoons ancho chile powder or paste, garlic powder, oregano, cumin, salt, and pepper. Bring to almost a boil. Add vinegar and pineapple juice. Bring to a boil and immediately remove from heat. Allow to cool completely. Proceed with recipe as directed below. Use your favorite bun. 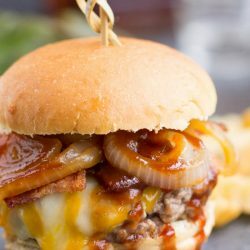 I have used a regular hamburger as well as a potato bun. A sourdough or ciabatta bun would also be tasty. As well, I used a provolone cheese. 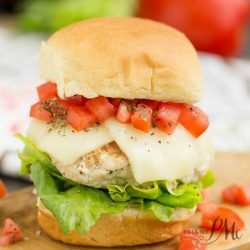 You can use whatever you have on hand or any mild cheese. 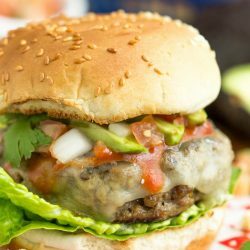 Of course, avocado, lettuce, tomato, roasted poblano peppers would all be great toppers for this burger. Place the chiles in a saucepan and add 1 can chicken broth. Fill the can with water and add it to the pan. Make sure the chiles are submerged in the liquid. Bring to a boil. Boil 5 minutes. Turn off the heat, cover, and allow to sit 30 minutes. Remove peppers from the liquid. Return liquid to a boil and reduce to half to about 1 cup. Allow peppers and liquid to cool. Meanwhile, heat 2 tablespoons vegetable oil in a large skillet to medium temperature. Add ancho chile powder, garlic powder, oregano, cumin, salt, and pepper. Bring to almost a boil. Add vinegar and pineapple juice. Bring to a boil and immediately remove from heat. Allow the liguid to cool completely. To a blender add the guajillo chiles, the reduced guajillo liquid, and the vegetable oil-spice mixture. Pulse until pureed and smooth. Add 2 tablespoon seasoning mixture to the ground pork and mix into the meat. 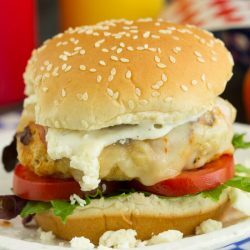 Cover burgers in seasoning sauce, for 30 minutes to 1 hour turning occasionally. Cook either on a stove top or grill 5 to 6 minutes per side on med-high heat. Turn just once and do not mash this will press the juices and flavor out. 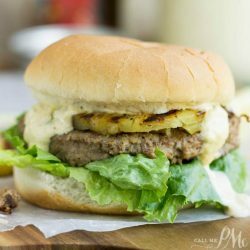 Place burger on bottom bun, top with cheese, grilled pineapple slice, red onion, chopped cilantro, sauce and/or mayo, optional toppings. 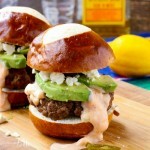 I love al pastor tacos so I definitely need to try this burger!